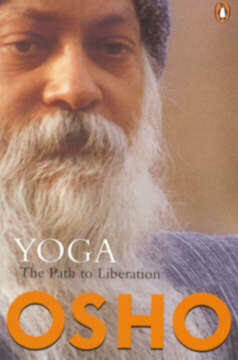 Osho geeft in dit boek ‘Yoga The Path of Liberation’ aan, dat het leven niets anders dan een uitdrukking van Stilte is. We komen uit Stilte voort en daarna raken we het spoor bijster. Om deze Stilte weer te ervaren en tot bevrijding te komen, moeten we de weg die teruggaat naar ons wezen vinden. Alleen dan ontstaat er een complete cyclus. En zo kunnen we komen tot de staat van kaivalya, een staat die Osho zelfs hoger acht dan moksha of nirvana. De sleutel hiervoor is eenvoudig: we moeten ons niet met ons lichaam en onze mind identificeren. Alle identificaties zijn immers naar buiten gericht. En de reis moeten naar binnen gericht zijn. Osho benadrukt de combinatie van intelligentie, bewustzijn en humor tijdens deze reis. Osho speaks of Patanjali′s system of preparation for enlightenment as empirical, a tool to work with. He talks on mastery over the five bodies of the human personality – the food body, energy body, mental body, intuitive body and the bliss body; also on cognition, non-attachment and liberation. “The yoga system of Patanjali is not a philosophical system. It is empirical. It is a tool to work with. But still it has a philosophy. That too is just to give an intellectual understanding where you are moving, what you are seeking. The philosophy is arbitrary, utilitarian, just to give a comprehensive picture of the territory you are going to discover; but the philosophy has to be understood. “The first thing about the philosophy of Patanjali. He divides human personality into five seeds, five bodies. He says you don’t have one body; you have layers upon layers of bodies; and they are five. The first body he calls annamay kosh the food body, the earth body, which is made of earth and is constantly to be nourished by food. Food comes from earth. If you stop taking food, your annamay kosh will wither away. So one has to be very alert about what one is eating because that makes you and it will affect you in millions of ways, because sooner or later your food is not just food. It becomes blood, your bones, your very marrow. It circulates in your being and goes on affecting you. So the purity of food creates a pure annamay kosh, the pure food body. “And if the first body is pure, light, not heavy, then it is easy to enter into the second body; otherwise it will be difficult you will be loaded. Have you watched when you have eaten too much and heavy foods. Immediately you start feeling a sort of sleep, a sort of lethargy. You would like to go to sleep; awareness immediately starts disappearing. When the first body is loaded it is difficult to create great awareness. Hence fasting became so important in all the religions. But fasting is a science and one should not fool around with it.